Unrivaled analysis of global QA & testing practices. How do trends in mobile, analytics, cloud, and the Internet of Things impact QA and testing? What’s driving the increase in QA and testing budgets? Which industries are seeing the fastest adoption of test automation, customer experience testing, and cloud solutions? Read the report that gives you solid answers to these questions and much more, based on the insights of 1543 executives from 25 countries and the expertise of more than 40 subject matter experts. 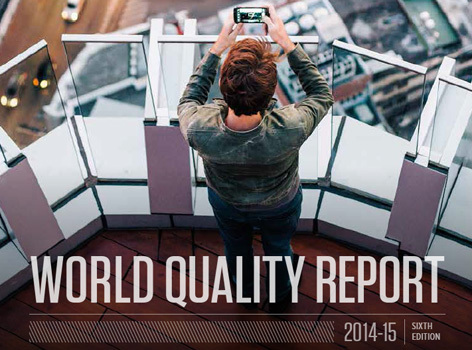 It’s all there in the 6th edition of the World Quality Report, an in-depth research study commissioned by industry leaders HP, Sogeti, and Capgemini. 귀하는 위 2항의 선택정보의 수집•이용에 대한 동의를 거부할 수 있으며, 동의를 거부한 경우에는 HP는 귀하에게 그와 관련된 정보나 혜택은 제공하지 않게 됩니다. 개인정보를 제공받는 자: HP는 HP의 프라이버시 정책을 준수하여 위와 같이 수집된 귀하의 개인정보를 미국과 전세계의 다른 HP 소유의 사업체로 이전하게 됩니다. 한국 HP 가 수집하는 개인정보는 수집 시점에 미국에 소재한 Hewlett-Packard Development Company, L.P. 가 소유한 시스템으로 전송됩니다. 기타 개인정보를 제공받는 HP업체명은 개인정보취급방침(http://www8.hp.com/kr/ko/privacy/privacy.html)을 참조해 주십시오. 개인정보를 제공받는 자의 개인정보 보유 및 이용 기간: HP 사업체들은 처리 목적 달성 등 그 개인정보가 불필요하게 되거나 정보주체의 요청이 있는 경우에는 그 개인정보를 파기하게 됩니다. 동의를 거부할 권리 및 동의 거부에 따른 불이익: 필수정보의 공유는 귀하와의 계약을 이행하기 위해 반드시 필요합니다. 그러나 귀하는 선택정보의 공유에 대해서는 동의를 거부할 수 있으며, 동의를 거부한 경우에는 HP는 귀하에게 그와 관련된 정보나 혜택은 제공하지 않게 됩니다. *By downloading this report, you agree HP may contact you by email with information that may interest you (product, service, and support information, or market research). When you submit your cell / mobile phone number and choose “yes” for cell phone contact, you consent and acknowledge that autodialed and/or pre-recorded telemarketing calls by or on behalf of HP may be made to the phone number you provide. Data rates may apply. Consent is not a condition of purchase. Terms and conditions.